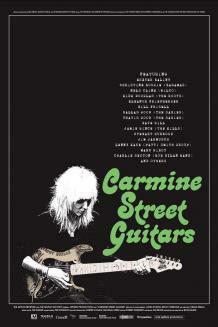 “Director Ron Mann finds a rewarding tangent on rock 'n' roll iconography at Carmine Street Guitars, a Manhattan music shop whose proprietor builds custom instruments out of wood salvaged from demolished Gotham buildings. The doc's a delight for six-string gearheads and a reverie for those who still treasure what remains of pre-Bloomberg, pre-Giuliani New York. “The store, in Greenwich Village, is both a showroom and workshop for Rick Kelly. For company, Rick has his mother Dorothy, who knits a bit when not answering the phone and keeping books, and a young apprentice named Cindy Hulej. With shaggy blonde hair and rock-chick eyeliner, Hulej is used to having male customers assume she doesn't know a pickup from a pickguard. She does, and has been learning Kelly's brand of luthiery, though her main passion (aside from maintaining a social media presence for the store) is more decorative than technical: She burns designs, text and portraits into some of the finished guitars.